Hello there, and welcome to Meeple Like Us Radio – the radio channel for meeple… like you! I’m your friendly local anchor, Bobby Massive, and I’d like to thank you for tuning in. We have a very exciting programme for you today, and one by one I’d like to introduce you to our fantastic team of field reporters that will be bringing you all the news that’s fit to print. And a fair bit that isn’t! First though, we have Pauline with a word from our sponsor, News@11! Thanks Pauline for that informative segment about our sponsors, News @ 11. Now we’ll move on to… hang on, I’m getting a piece of breaking news from our producer. Apparently… apparently we’re not actually sponsored by News @ 11 at all and we should stop saying that because otherwise people will think this review is ‘totally bias’. Also the makers of News @ 11 have been in touch to say that they don’t really want to be associated with our channel for fear it would cheapen their brand. Exciting developments already, and so early in the day. Now, with the obituaries from yesterday, I’m going to pass you on to our Death Correspondent – or Deathspondent – Peter. Peter, who’s dead and why should we care? Yes, every single one of us at the studio is absolutely heartbroken… that we don’t have any champagne on hand with which to properly mark his passing. Unfortunately, we cannot dwell on that because we have an urgent update on an earlier story. We need to return you to our corporate anchor, Pauline, to give you some important new information on our non-sponsor. Thank you for that useful update, Pauline. 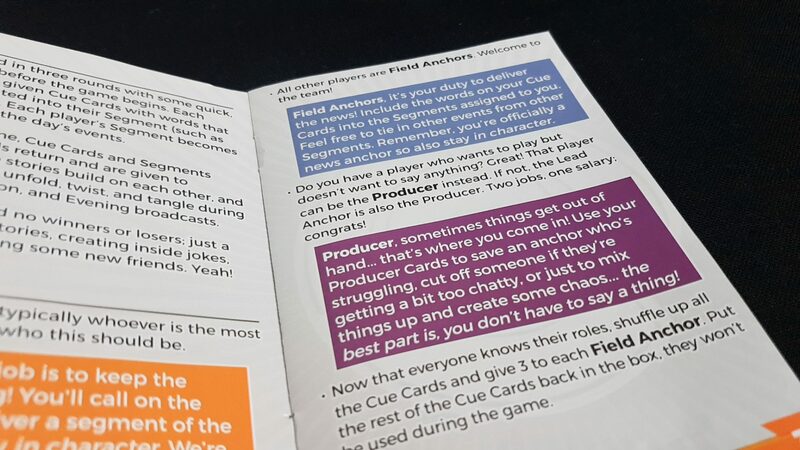 I’d also like to point out the interesting producer cards which permits the lead anchor, or a player reluctant to throw themselves in front of the cameras, can make the game more interesting by throwing an emerging situation into a segment like an unexploded hand-grenade. Ha ha. Ahem. I’m being told by our producer that our weather segment will have to be delayed for a few moments while some technical difficulties are being resolved. Dead air is the greatest sin in broadcasting so I’m going to have to try to keep your attention while the issue is rectified. Uh. An interesting aspect of News @ 11 is that it seems like such a straightforward thing to do – just link a few words together in a segment context decided by a lead producer. It’s amazing though how difficult that can be if you don’t know what’s coming. You know your keywords, and those are the only ones you need to say. The context though – that comes out of nowhere. You begin with two words you need to incorporate, and then you get another, and another. More than this though, the cards from previous segments get shuffled so maybe now you’re left trying to work out how a muffin-induced car-crash on the local road is having a sudden major impact on your sports and culture segment. That combined with the permanent element of written in-jokes means that this isn’t so much ‘BBC News: The Board Game’ as it is dispatches from Night Vale as retold by someone in a Ketamine fugue state. It can be very, very funny but that depends very much on the group you have and how confident they are with the convincing expression of extemporaneous authority. It’s uneven, which means… ah, never mind. It turns out we can now bring you to Roz, with the weather. Thank you for that Roz, very helpful! That wraps up the morning edition of Meeple Like Us News. Thank you for listening I have been your host, Bobby Massive. Make sure you come back for our afternoon bulletin where these story developments will undoubtedly continue to, uh, develop. 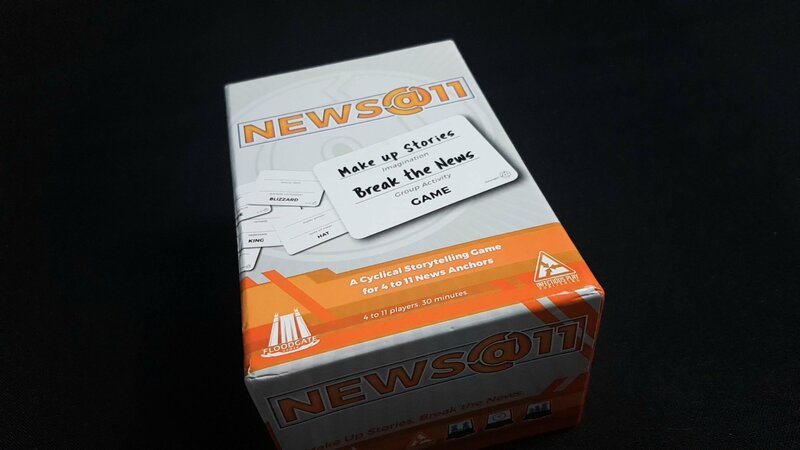 The setup of News @ 11 makes a convincing pitch – I backed it almost instantly upon hearing it and I rarely back Kickstarter projects. This one though has a little sparkle of magic that appealed tremendously. And by and large, it fulfills the implicit promises the box makes. This absolutely is a fun game of repeating themes and jokes that will keep everyone laughing… provided everyone involved is funny enough to nurture the comedy out of what might be somewhat infertile soil. It’s not that people are as funny as their cards, because that’s not true – this is a more sophisticated game than Cards Against Humanity which is largely the poster child for that style of game. At the other end of that spectrum you have games like Funemployed where comedy is created through the sheer joy of weird juxtaposition. You can be funny in Funemployed because the cards, generally, lead you to comedy. Where’s the joke? Follow the traits and you’ll find it. The problem in News @ 11 is that the funny isn’t in the cards, and it’s not really in an individual. It’s to be found in the collaboration of the table and a weak link can turn this into a dreadfully somber experience. News @ 11 works when the ideas and references all bounce against each other and react violently in collision – like firing raw comedy through a particle accelerator. For that to happen, segments need velocity. They need heft. They need to make an impact when they land. Let’s say you have a card that says TOFFEE and SPOT (a real card from my deck). You’re dealt out the Traffic segment. Now – be funny. That’s okay – that’s a solid bit. The thing here is – let’s say you hand that card to another person. One less confident with the weaponization of conversational and improvised whimsy. Both of these are perfectly correct and valid segments, but one gives everyone else material with which to work and the other… just fulfills the requirements of the game but doesn’t give anyone else the oxygen that the fire of comedy needs to burn. It’s a smothering segment that is going to make everything else a good deal cooler. Technically they’re the same segment with the same information provided, but News @ 11 thrives or dies in the difference between narrative and story. The latter – the order in which things happen. Narrative – the dressing around it. 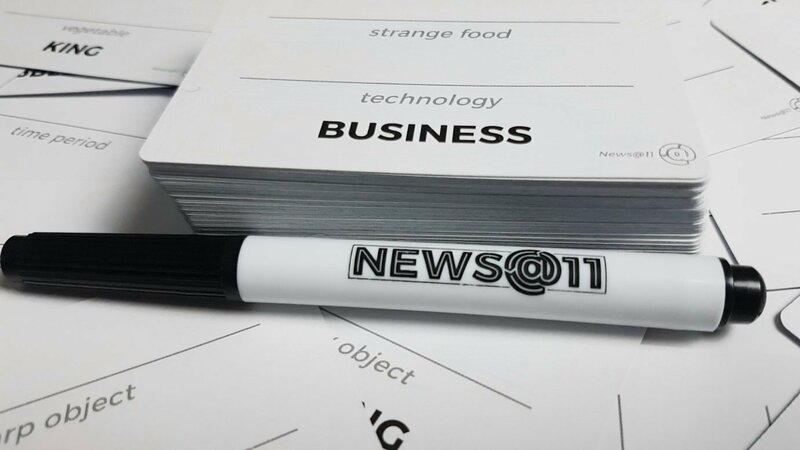 News @ 11 asks you to tell a story, but what it really needs is for you to weave a narrative. Look at what the first example there did – it created a geography and a local ecosystem. It captures some human comedy (kids being so excited at free toffee that they just stuck their tongues in and now need rescued). It adds a tinge of darkness (the tongue amputations) and a kind of formalist approach to education that emphasises punctuality over proportionality. It even throws in a reference to Discworld with the treacle mines. People can take this in all kinds of directions when they end up with this card in their hand. What did the second example do? It did what was asked. News @ 11 though only works when everyone does more than that. That’s not inherently a problem – ‘simply doing what you’re asked’ is the baseline of tiresome obligations, and people generally try to aim higher when they’re doing something for fun. The problem there is that this is a big ask – not everyone can do the necessary storytelling to bring these cards to life and they’re going to bring everyone else down as a result. All you need is for one person to be having a bad night and the fun of everyone else is violently constricted as a result. That bad night might be for many reasons, and unfortunately one of those reasons might be ‘the simple pressure of being on the spot’. Perfectly lovely, funny and articulate people can nonetheless find themselves with little to contribute. And that might be simply because of the fact suddenly everyone is waiting with anticipation for a segment where their mind has gone aggressively blank. 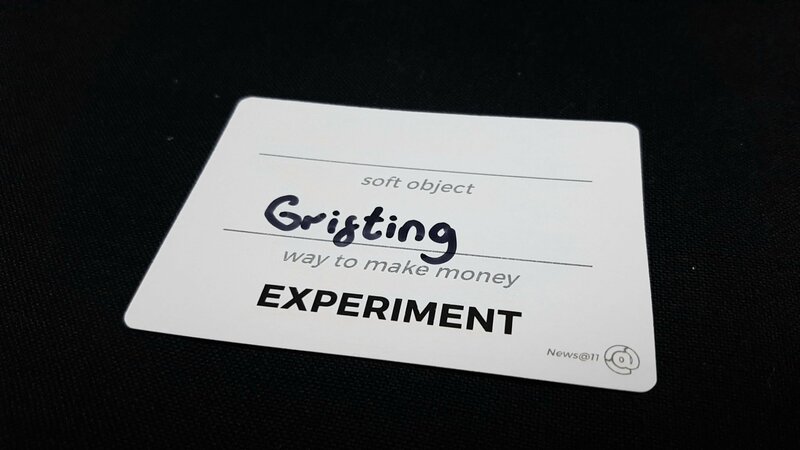 I’ve used this game in my cardboard prototyping class and it was painfully obvious how different the experience of play was when there were variable levels of buy-in and enthusiasm. It’s a game of recursive storytelling and reference – the problem with that is that you still have the dead elements floating around in the melting pot long after they should have been fished out as toxic. The humour in News @ 11 requires clever call-backs and word play. It needs comic misinterpretation and intentional cross-communication. In one game we played, a story about George Michael and a loud bang later got pollinated into a story about Buckingham Palace and a death. The morning segment started off with George Michael loose in a park while Johnny Depp was commandeering his concert. The story in the evening had become the obituary of her majesty after a loud banging from George Michael. It was funny, it was spontaneous, and it wouldn’t have worked if everyone wasn’t creating an abundant richness of reference for everyone else to mine. To its credit, News @ 11 recognizes this itself and provides for a producer role where someone that doesn’t want to take part in the segments just gets to throw spanners into the mechanisms of everyone else. It’s fun, but it’s passive – and there isn’t enough variety to really make that meaty enough of a position to play by itself. 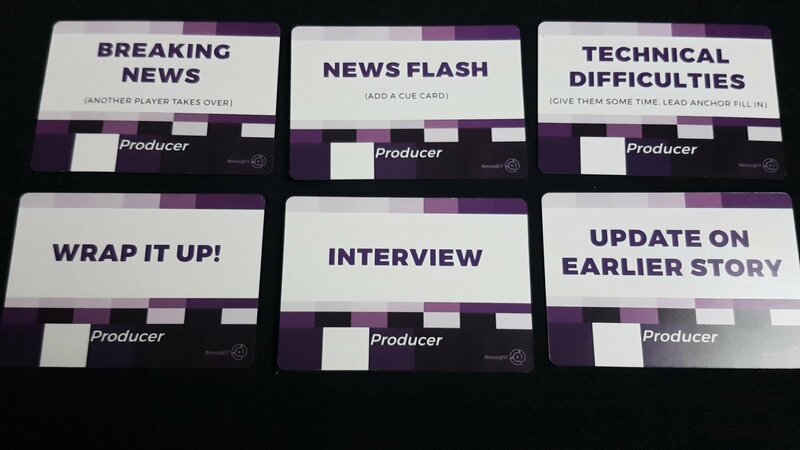 There aren’t enough producer cards, or indeed segment cards, to permit much in terms of surprises. It’s all down to the topic key cards to keep everyone on their toes and if you don’t have those then it all becomes a bit perfunctory. It’s a shame really because I can see the producer role becoming genuinely phenomenal with some more tools in the tool-bag. 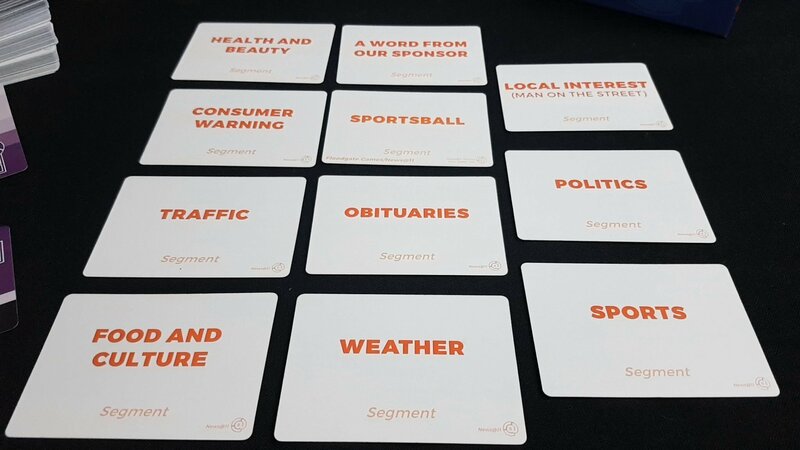 For example, the news flash card lets you throw another cue card into someone’s segment which is the game equivalent of pulling a loaded gun on them. That’s a genius card and if there were more cards like this a producer could have an important role to play in really dialing up the fun. As it is, the producer cards occupy a weird hinterland of being fantastic when employed well but having no reason at all for their employment. There are no points or wins in News @ 11 and all that leaves is the inherent joy of improvisation. Suddenly forcing someone to cut in over another player’s segment can really help with that. If though you’re already doubting your ability to be funny under pressure maybe it’s best just to watch as other people do their thing? If you have friends that are good at these kind of exercises I suspect you’ll find it just as entertaining as Funemployed and with considerably more scope to grow over time. For others, well – Funemployed gives you a lot more support to be funny and makes the consequences of failing considerably less socially awkward. Think of News @ 11 as being a game that needs to be considered based on the player you think is the least best fit for the experience. If you’re still happy to give it a go, you’re going to have fun. If it gives you pause for thought, let that be your guide. It’s more of an improvisational exercise than it is a game in its traditional sense and not everyone is going to be good company for exploring the contents of the box.